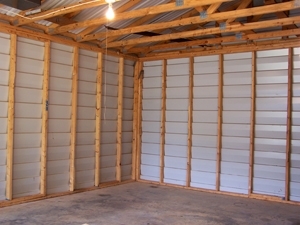 Homeowners know that a garage is a prime place for storage. 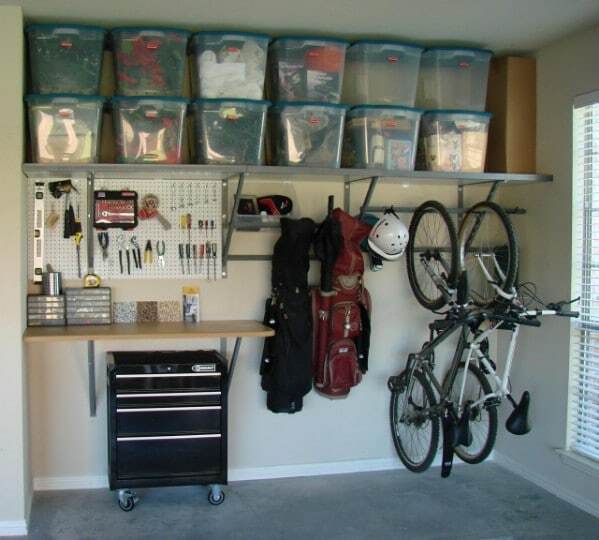 But even that said, the wide empty space of the garage is not always enough to keep your things nice and tidy. Enter the garage shelf, a fun, creative and useful way to optimize your garage storage. Today we will explore some of them as we take a look at some great DIY garage shelf ideas. Nice and tidy—every inch of the shelf has a distinct purpose. This creation from popular woodworking is the perfect option for the neat freak that wants to maximize every inch of space that they have at their disposal. Do it yourselfers will be particularly pleased with this arrangement as it will leave their tools nice and organized at all times. There nothing wrong with big broad shelves that can be used for any purpose that you see fit on any given day. These shelves from DIY Blog Overflow will be great for the user with lots of stuff to store. Big families, in particular, are going to love the ample room that these large shelves provide. Hey, décor counts even in the garage. Get creative and add a unique flair to your storage shelf by throwing color, interesting designs, and even fun and unique materials together like they did on Pinterest. Putting just a little bit of extra work into the creation process will leave you with cooler results that you can enjoy for many years to come. The more versatile the better right? Built shelves that will allow you to store your extra stuff, and even hang up your bike and golf bag, just like Monkeybarstorage – Hang Everything. 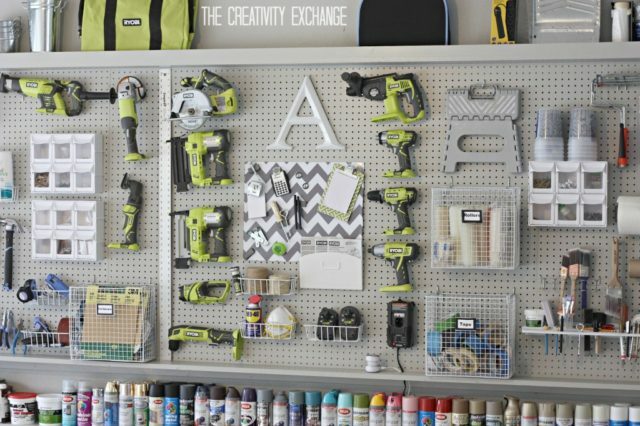 This pegboard on Big DIY Ideas is the quintessential garage storage option. It’s simple, efficient, and great for accommodating your tools. Multiple shelving, like the one seen here from Infarrantly Creative, is a great way to store sprays and other chemicals that you might keep in your garage. Don’t discount the value of having something to hang your rakes, shovels, hoes, etc. on. 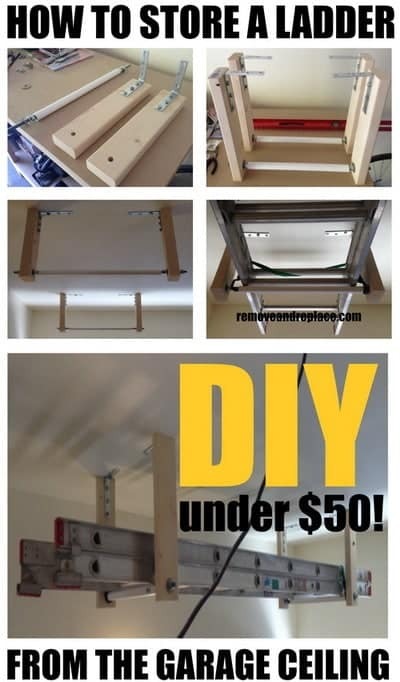 Hanging racks like these from Instructables, are a great, and easy method of garage storage shelves. Remember that regardless of what type of shelf design you decide to use you don’t have to stick with the plain sanded wood look. Taking a little bit of time to paint your shelves is going to add warmth and personality to your garage, as seen here by Global Garage Flooring. Keep in mind that storage does not have to be limited to the wall. Going with an overhead option like you see here from Garage Overhead might require a little bit of ingenuity but it will also free up a lot of floor space. 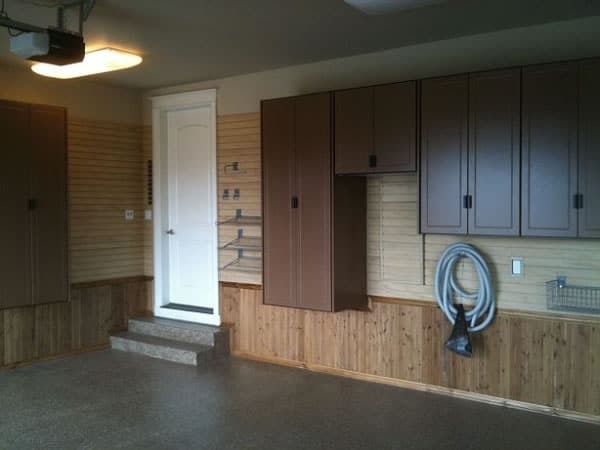 The garage locker space provides a unique opportunity to give everyone in your family their own personalized space. With a little bit of paint and creativity, you can even give this fun idea from Woodbourne Buiulders Inc. a sports twist. If you have little athletes in your family, you might find plenty of opportunities to cater to their interests. Sometimes you don’t need to store boxes crates or tools. Nevertheless, if you and your family members own bikes then you are well aware of how much garage space that they can take up. Adding simple bike racks like in this pic is a great way to mitigate this problem. Hey, why start from scratch if you don’t have to right? If your garage still has some exposed wall studs, you can use them to advantage to build little nooks and crannies for some of your stuff like Extreme How-To did! 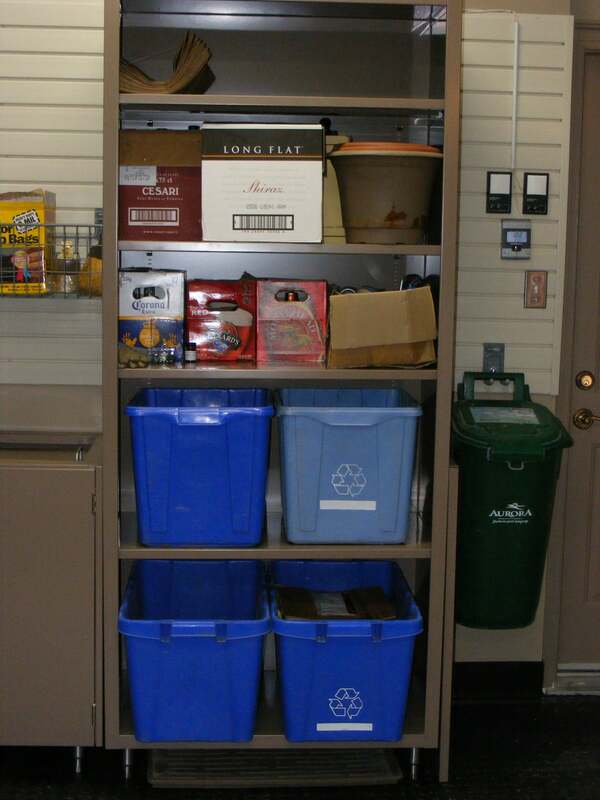 Recycling bins are another thing that can take up loads of space in your garage, especially if you have a large family. The good news is that it doesn’t have to be this way. Stacking them up in creative ways like Nuvo Garage will save lots of space. You don’t have to be a woodworker to enjoy good shelving. 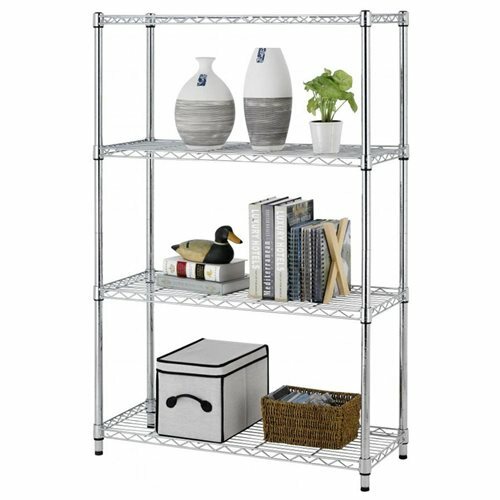 Prepackaged metal shelving like this one from Rakuten is affordable, quick and easy to assemble, and ultimately just as effective as a wood alternative. If you want to get as economical as possible you can even use plastic shelving sets like these from Argos. They are durable, relatively stable, and a good quick fix to your garage storage needs. Mixing it up with a combination of shelves, cabinets, and drawers like Shane Tracey is an excellent way to diversify your options and ensure that your new garage shelves benefit from as much utility as possible. We’ve talked about keeping your stuff low, and about keeping it high but don’t forget that if you are really in need of a lot of storage you might benefit the most from doing both. A multi-tiered approach similar to Mina Rose Beauty is a great way to keep your floor space open and make due with the room that you’ve got. The ladder is another one of those pieces of equipment that, while necessary does take up a ton of room that you might not have to spare. You can go a long way towards solving this problem by installing a simple garage ladder hook as seen here by Remove and Replace so that you can hang this bulky gear up. Last but not least, the garage closets from Garage Themes. 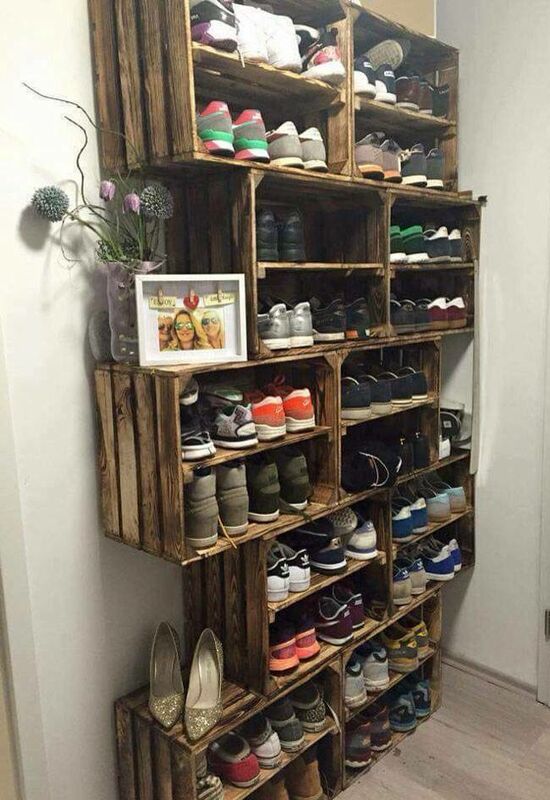 Depending on your level of skill, making these yourself might be a little bit of a challenge but it will certainly be worth it to the person that could benefit from some comprehensive storage. See other Outdoor Wood Benches and Hommade Coffee Tables to improve your home. So, what did you think? Did you like the list? Did you learn something? 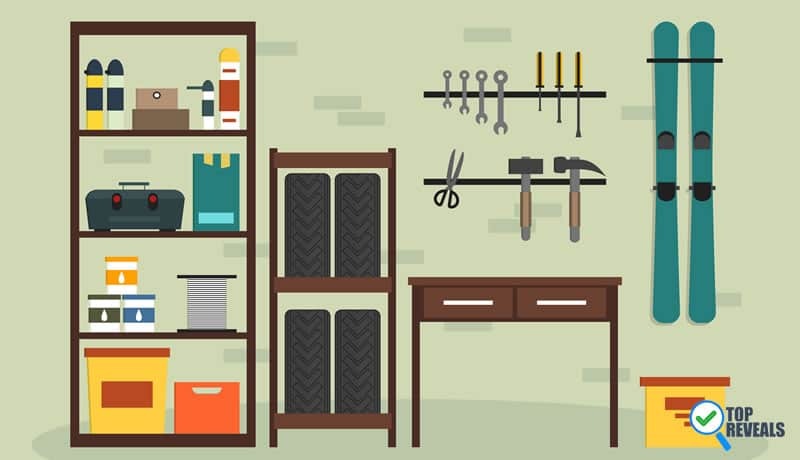 We hope that this list left you with some fun and exciting new ideas to help tidy up your garage, and benefit from some extra storage space. If you did like the list then we hope you will share it and leave a comment below letting people know which idea was your favorite.